Lexus has been targeting the so-called junior executive market sector for about 15 years with three successive generations of the IS saloon, each progression getting more strongly challenging to the establishment. No more so than this 2.5-litre petrol/electric powered hybrid derivative dubbed the IS 300h that offers up both remarkable fuel economy, lower than average for class running costs, competitive driving performance and, importantly, I think, styling that suggests a touch of excitement. Lexus, and more so its compatriot Toyota brand, are no novices when it comes to hybrid powered cars though from the outset conservation was allied to conservative looks, a strong degree of buyer suspicion but the breakthrough has now come. No longer is a hybrid car a novelty, sage buyers are realising the potential benefits of this propulsion system. This IS300h is slightly larger than both its predecessors, though remains a sensible sized vehicle for the role it is intended to play. It is based on a sophisticated platform employing a rear wheel drive layout and a well-honed fully independent suspension system. Power is provided by a highly flexible petrol engine developing 178 bhp, which may not seem potent by current standards but apply a 141 bhp electric motor to assist and it is no wonder that it is claimed to reach 62 mph (100 kph) from rest in a smart 8.3 seconds plus a top speed of 125 mph. On the road I found that it was not so much a case of what you did rather how you did it and with a balanced throttle operation it proved possible to deliver some lively performance through the CVT automatic transmission system and some super satisfying fuel consumption – the maker reporting an official combined figure of 60.1 mpg which should be easily achieved or bettered once one has appreciated how to achieve a combination of good average speeds allied to efficient use of fuel by harvesting the energy through the battery powered electric motor. Sounds complicated but soon becomes a revealing way of motoring. Right from my first encounter with the first Lexus product I have been somewhat in awe as soon as I have occupied the very comfortable/supportive powered driving seat that has become an established Lexus hallmark. For example when the ignition is turned off the seat slides back to provide improved exit/access and once the safety belt is buckled up, the seat slides to the driver’s original setting. The fascia area is also far from ordinary, there is a mix of conventional analogue dials including a clock and other information including indicating the driving mode and the fuel consumption that, of course, changes if one sets the Sport mode system. Lexus sets out to provide a feel good factor and that is achieved by a very high standard of build quality, finish, trim and the use of high quality materials including full leather upholstery. Plus just about a full house equipment specification. There is not much to add, though the test car came with a metallic paint job and a Premium navigation system, adding around £2,600 to the price. Want more? Then there is a flagship Premier model around five grand more. The real battle in this class is that there is sufficient driving performance to attract the discerning driver. I came to the conclusion that there is driver satisfaction in abundance – admittedly in this strongly contested market sector there are varying aspects that might favour one product with certain customers. Shod with low profile tyres, I found the ride to be firm yet comfortable, the feel through the steering wheel is positive yet with a light action, the four ventilated brake discs provided smooth and progressive stopping power (aided, of course, by the retarding action of the energy regeneration system) achieved with a light pedal action. The CVT transmission is smooth and responsive providing one urged the throttle, especially when drawing on both power sources. At the other end of the scale is an ability to creep away on electric power, good for the neighbours on that early morning departure but be wary of dozy pedestrians! The power pack batteries are stored under the boot floor where normally, not so long ago, a spare wheel would reside, which makes for a generous sized boot capacity…but don’t get a puncture! Some other factors – extensive air bag protection including the driver’s knees, a foot operated parking brake backed up by a hill start assist system, smart entry and start, tyre pressure warning, rear view camera plus audible parking sensors and auto fold exterior mirrors. Add to that a low VED Band B, and Benefit in Kind tax at 13%. 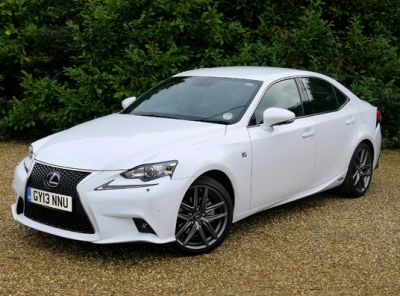 Considering what a well loaded medium hatch back car can cost, this Lexus, even considering the optional extras, suggests a keen deal, both for the private owner and for the number crunching fleet operator. Price From: £33,495- as tested £36,100.